Conceptualist art, minimalist art, post - modern art: these forbidding terms characterize works of art which generally fail to engage, involve and interest the viewer. These works are part of closed circuit between artist and artwork. The work at Georgia Amar is entirely different. Embodying the artist's philosophical insights and aesthetic vision, the work, in a wide range of media always succeeds in involving the spectator. Her thought provokes the viewer's thought; her emotions, typically cool and understated, entice the emotional response of the viewer. Georgia Amar's art transforms the witness into collaborator in a series of novel and arresting insights and restructuring. Whether working with lithographs, serigraphs, oils, fabrics, environmental installations, light or stained glass, Georgia's art softens and blurs the hard edge of much contemporary artwork. The dryness of such work is replaced in her case by a fluidity informed by a sense of the Pythagorean theogolgy of arithmetic. The sacred geometry of number and ratio of a spiritualist vision of the universe. Colour in Georgia Amar's art is never static. Any given colour imperceptibly moves through a range of hues and intensities revealing a master hand at colour gradation. Perspectives suddenly shift causing the viewer to reassess awareness of self in space. Popular but not populist, the multi-media work of Georgia Amar transforms a wall or space into a privileged place of contemplation, a place of withdrawal from the surrounding world so that the viewer, focusing on a inner calm, may emerge from the experience of concentration newly energized. Graphics, canvass, fabric, mural, glass: surfaces for the celebration of the artist's creativity. Georgia Amar's installation at Beth Tikvah, The Six Days of Creation, is the culmination of her career to this point. The treatment of the windows of the East Wall, of stained glass sanctuary doors and the revolutionary Eternal Light is the result of an uninterrupted meditation on space, light and colour by an artist born in Morocco, educated there and in Israel and transplanted to central Canada. The world she sees is horizontal, consisting of vast stretches of sand, snow, water or trees. This horizontality is mediated by the presence of the human (the image of the divine, but on a much reduced scale) signaling the movement from immanence to transcendence and introducing the element of verticality. The fundamental Judaic theme of the divine gift to man of on-going creation which is brought to a series of weekly conclusions by a divinely ordained day of rest, reflection of light, colour and glass. The many studies leading to the final realization of the work of art are in their own right worthy of aesthetic response. The Amar installation is the ideal environment for contemplation, requiring, as it does, the presence of the worshipper to produce its own completion. Creation of the world proceeded from the divinely spoken command. The word was spoken and instantly that which the word represented was called into being. Creation thus is the material realization of the will of the divine spirit, symbolized as breath or speech. Georgia Amar transforms the verbal icon of creation into a visual one, at once of the highest abstraction yet at the same time dazzling in its simplicity and inevitability. However, the modernity of her gesture cannot eliminate the essential fidelity to age-old tradition. Boldly avoiding the familiar and recognizable as instances of the forbidden graven image, the artist here has proceeded directly to the distillation of the perceptible as a locus for an invitation to prayer, rather than a distraction from it. Georgia Amar has taken as the point of departure for her installation the verse from the Torah, "God said Let there be light, and there was light." At its most literal level, the separation of incompatible realms of light from those of darkness, preparing the transformation of the void into a plenum, in which is uttered becomes real and perceptible, the upper and lower panels of the installation separate creation from the inchoate. The six dominate bands of the color spectrum, evoking the six days of creation, fuse into the dazzling purity of white light, symbolic of the restfulness and plenitude of the seventh day. The bands of the spectrum themselves are subsumed under the dome-like structure of a solar arc or cosmic egg. The viewer is free to see a suggestion of the divine spirit brooding on the face of the waters. The image of dove and egg, a commonplace in the iconography of the Mediterranean world, is only hinted at in the text of the Torah, which is scrupulously UN-iconic. The dilemma of the artist is how to avoid the representational in the specificity of its literalness. Georgia Amar has boldly solved this problem, a central concern of religious art, by transforming the object of her creation into a middle ground with the light source on one side, generating creative possibilities and the viewer on the other side, procuring meanings and interpretations. At a level of meaning more profound than the literal, The Six Days of Creation permits the viewer to make distinctions and produce definitions. Indeed, in a subtle way, the central preoccupation of Georgia Amar's installation is the creation of discriminatory realms. The week is divided into six and one, weekdays and Sabbath; so too, the colors of light, principally six in number, become seven when added together, producing a pure, white light, symbolic of rest and worship. Just as the first six days of activity were followed by a day of contemplation, so that the Torah enjoins man to labor for six days only and then to rest. The rest, however, is not one of passivity: the absence of work permits worship to take place. The sabbatical day permits man fully to realize his purpose: to recapitulate by worshiping the Creator. The use of stained glass in places of worship is centuries old. Yet whether considering such creations as the Rose Window at Chartres or Chagall's Twelve Tribes of Israel in the synagogue of the Hadassah Hospital, the central concern of the artist has been the creation through representational means of a recognizable iconography. Hagiographa or merely decorative, the visual elements of the stained glass windows have always been based in realism. Georgia Amar's work is situated in the non-representational tradition of abstract expressionism and her installation at Beth Tikva is clearly destined for recognition as a major work of contemporary art and spirituality. Those viewers seeking to locate traditional Judaic emblems will be surprised to discover the concealment of the figurative. A literal Star of David is not represented. Instead the play of light against a glass permits the worshiper to perceive multiple Stars of David in motion in the interaction of triangular shapes on the sanctuary doors. The Six Days of Creation has been designed for a specific location and is intended to be viewed at specific times, namely those of the three traditional daily services. The installation is literally oriented toward the rising sun, whose daily circuit is a repetition of the movement of creation. Seen in the full light of morning services, the failing light of late afternoon services or the increasing darkness during evening services, the multiple panels reveal an ever shifting image, varied yet unified, complex yet simple. Georgia Amar has taken the traditional symbols and has recorded them, giving them a new life. Georgia Amar's boldest stroke has been her treatment of the eternal light. Traditionally, the ner tamid has been a specific lamp or bulb at a specific place in a relation to the ark. 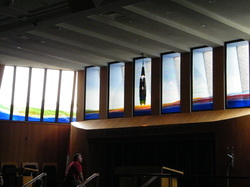 At Congregation Beth Tikva, the artist has produced along the entire width of the east wall, at its top, a permanent band of light, thereby consecrating not only what lies below, the ark and the scrolls, but also, in a burst of generosity and imagination, rendering sacred the entire space confined within the walls. The viewer is thus invited to participate in the process of sanctification. In traditional Judaic thought, creation as such is limited to the Creator. Man does not create: he recreates using the already existing materials in the world. Similarly, the artist recreates as well. However, the manner in which the artist combines and recombines the givens of reality more closely approximates the quintessential work of creation. In turn, the viewer (in this context, the worshiper) has as his task the reconstruction and appreciation of the artist's creative process. Thus, the very act of observing makes a man a participant in the sacred. The command calling light into being by naming it is central to the entire process of creation. In the mystical tradition within Judaism, the Creator is seen as the source and embodiment of all light. He is called the Infinite Light, the ein sof or. Indeed, when the Divine manifests itself to man, it is in the form of a burning bush or a pillar of fire. The cosmic drama in which the Creator and His Chosen People participate is an attempt to in gather the divine sparks cast out during creation, reunifying and rendering whole once more the divine. The process of human history is also one of the reunification and return. Judaism sees man in need of redemption (return from exile to Eden) rather than salvation. The fundamental movement in Judaic thought is horizontal rather than vertical. As an epitome of human history, Judaism envisages the in-gathering of all Jews into Israel. While that is being accomplished, the divine commandments are in force and Jews are enjoined by example to be or l'goyim, a light unto the nations. The artist has understood, almost instinctively, that the creation is the central moment in human history and that typologically, the giving of the Law was a repetition of the creating of light. The creation implicitly contains the laws which govern life and which later are explicitly given to us at Sinai. Georgia Amar's stunningly realized Six Days of Creation permits the worshipper at Beth Tikva to be immersed in the light of creation, to be purified through prayer and to be spiritually renewed in his daily life. Dr. Dobbs, a specialist in Comparative Studies, was educated in the Universities of Manitoba and Wisconsin. In his varied teaching career, he has taught Jewish Studies in Austin and in Tucson. He is the former Chairman of Commonwealth Studies at the University of Texas in Austin and now resides in Toronto.